A call from members of the National Union of Journalists in Leeds for the union to raise awareness of the benefits for society of independent and ethical journalism as well as highlighting examples of journalists taking an individual or collective stand in its defence is being marked today. The suggestion originally came to mark the anniversary of a national strike on August 7, 1985 protesting against an attempt by Leon Brittan, then home secretary in Margaret Thatcher’s Conservative government, to prevent the BBC from broadcasting a Real Lives documentary about Northern Ireland. Journalists and other broadcasting staff at the BBC walked out for 24 hours, supported by colleagues at ITN, across ITV and independent local radio. The proposal was put to NUJ members at the union’s last conference. Today, the union is calling on anyone who appreciates high-quality, independent, ethical journalism to add their name to a social media campaign – #ingoodcompany. A video report of the 1885 strike features not only CPBF spokeswoman Lesley Wood but the late media commentator Steve Hewlett, then an independent producer. After pointing out that the licence fee should be a guarantee of journalistic independence, he says: “The only hope there is for the freedom of broadcasting in the end is proper funding for the industry and strong unions inside it. “It’s the journalists and those who work in the industry, who stand up for the freedom of broadcasting, not the employers, not the governors, not the government even. It’s the journalists. A spokesman for the NUJ in Leeds said: “Now, advertising changes, global digital platforms distributing the best journalism without paying for it plus continuing political pressure mean society needs quality journalism more than ever to call politicians, governments and power to account. The NUJ’s campaign day coincides with the TUC’s Love Unions week of events. 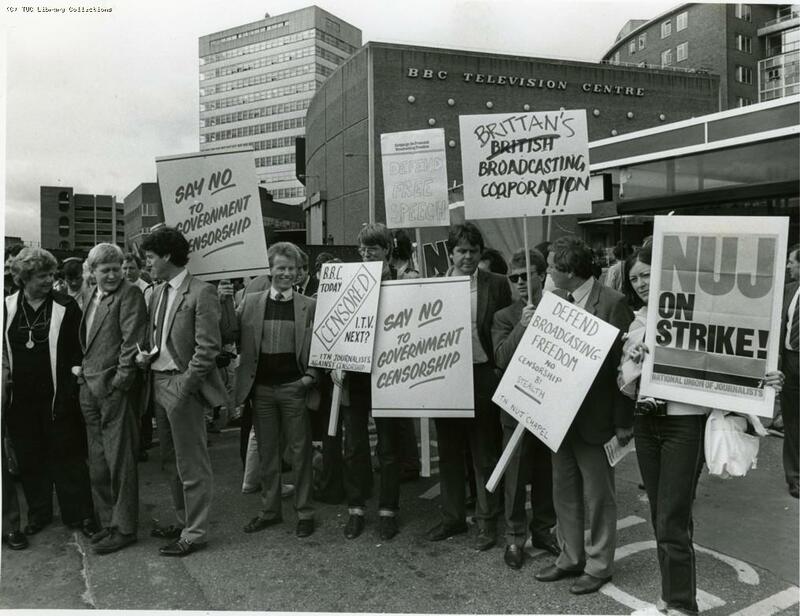 Picture: Late agony aunt Claire Rayner, DJ Mike Smith and a youthful Jeremy Paxman, left, were among those on the picket line outside Television Centre in London on August 7, 1985, when journalists around the country protested against government attempts to prevent the broadcast of a BBC documentary about Northern Ireland. Image (c): TUC Library at London Metropolitan University.